Putting residents in control helps with many issues in communities — not least financial inclusion. Here’s what we’ve learnt so far about the benefits of a resident-led approach to improving financial health, and how this way of working can be put into practice. This blog was originally posted on Financial Health Exchange. In sectors such as health, housing, community safety and financial health, established organisations and providers have the potential to create and deliver fantastic services to address the needs of communities. But this isn’t always the case. In our experience, this is often because they fail to take into account local context and circumstances. Through our Big Local programme, 150 areas across England have the opportunity to use £1m to make their area an even better place to live. The principles of the 15-year programme are simple. Local residents must form the majority in the partnership that steers the direction for each area, and it is this group that decides the vision, the priorities, who they will partner with and what activities, services or projects are funded – all of which is captured in a plan. A recent survey of partnership members revealed that 78% of people felt that Big Local was giving residents more control over what happened in their community, 67% felt Big Local was contributing to lasting and sustainable change and 87% felt that they would achieve their long term goals. Big Local partnerships use community researchers to identify and report on local issues. As well as using data, researchers try to engage residents of the community in conversation in order to get a better understanding of their real lived experience. Working in this way takes time, but the value of this community consultation is that it enables specific local context and circumstances to surface. For example, it may be that the current service is provided in the wrong place or time, or isn’t trusted locally. How can we start meaningful conversations about financial inclusion? One of the most pressing priorities that has emerged across the 150 areas is around the economy and financial inclusion. Engaging people in conversations about finance can be difficult. Issues around finance tend to rise to the surface in conversations about individuals and their families, such as, ‘What would make your life even better?’ and ‘What would make a difference to your family?’, rather than those that focus on an area or place. In this way these community consultations reveal the importance of language. In our experience, residents in Big Local areas don’t talk about ‘financial inclusion’ or ‘the economy’. These are just the umbrella terms used to describe the things that do matter to people: loan sharks; debt; money; budget; paying the bills; buying school uniforms; or the fridge, freezer or washing machine breaking. These problems are often underpinned by a lack of confidence and awareness about money management. 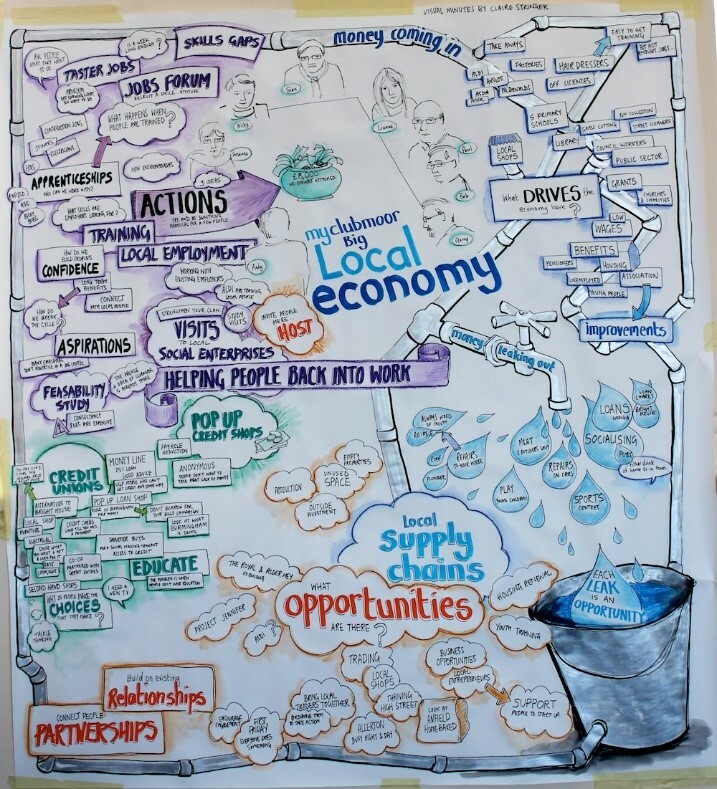 The interconnection between financial inclusion, health and wellbeing, education and employment means that Big Local areas are doing a range of activities and projects that try to deal with these various concerns holistically, working collaboratively with partner organisations. Because Big Local starts with residents, it is residents who identify and select appropriate organisations to work with, and invite them to be a part of their plans. This means it is often residents setting the terms for engagement. For example, in North West Ipswich, the area had a particular problem with the operation of illegal loan sharks. The community developed a relationship with a local credit union, which agreed to collaborate in tackling the issue. So on their behalf we made a social investment in the East of England credit union, Eastern Savings and Loans (ESL) in May 2015.
run 6 workshops to train volunteer credit union champions to raise general awareness of the credit union. ESL have reported that there has been an increase in savers and the total value of savings held by people in the area. Residents are also using the credit union’s loan facility and it is estimated that the amount saved by Big Local residents in borrowing from them, as opposed to other lenders is between £6,500 and £10,000. These projects are part of North West Ipswich Big Local’s wider thinking and work on health, support for parents, social isolation, physical and mental health, and supporting local businesses. For example, the partnership are looking to set up a hub on the high street to act as a community advice centre for offering loans, hosting business start-ups and training young people as volunteers. The long term nature and in-built flexibility of the Big Local programme allows areas to respond to the reality that debt is often a symptom of many things going on in people’s lives. By taking this long term view and putting control into the hands of local communities, Big Local can create lasting solutions that will have a positive effect on people’s lives for years to come.